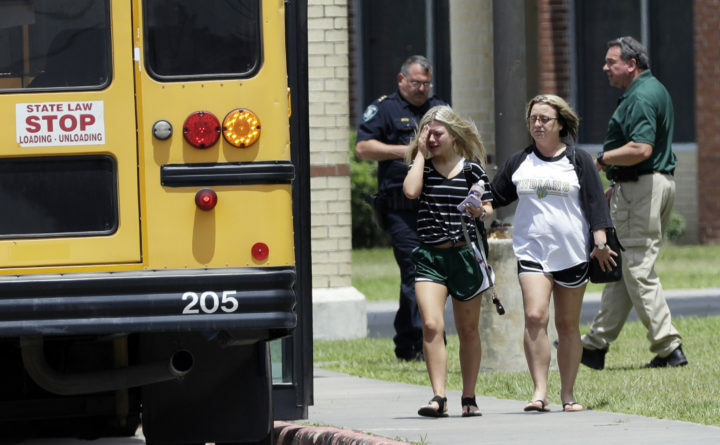 Santa Fe school had a shooting plan, armed officers and practice. And still 10 people died. A student, left, reacts after retrieving her belongings inside Santa Fe High School in Santa Fe, Texas, May 19, 2018. Students and teachers were allowed to return to parts of the school to gather their belongings. A gunman opened fire inside the school Friday, killing several people. SANTA FE, Texas — They, like so many others, thought they had taken the steps to avoid this. The gunman in Santa Fe used a pistol and a shotgun, firearms common to many South Texas homes, firearms he took from this father, police said. So there were no echoes of the calls to ban assault rifles or raise the minimum age for gun purchases that came after the shooting three months ago in Parkland, Florida. The town did not come to a standstill as it dealt with the aftermath of the shooting: People still ran errands and had yard sales and barbecues. The community library closed “out of respect for the victims,” but organizers of a library benefit sale decided to hold their event as planned in the lobby and parking lot. The Santa Fe High baseball team was still scheduled for a playoff game Saturday night after canceling one on the day of the shooting. Washington Post writers Devlin Barrett, Julie Tate, Alice Crites and Jennifer Jenkins contributed to this report.